This Dallas restaurant's decor is comprised entirely of animatronic singing fish. What do you look for when choosing an amazing restaurant? Probably things like great food, attentive service, and delightful ambiance—and by "delightful ambiance," you almost certainly don't mean walls adorned with hundreds of animated singing fish that were part of a fad from the early 2000s that still haunt your dreams to this day. Unless, that is, you're headed to Flying Fish in Dallas. Dallas's ABC affiliate WFAA recently profiled Shannon Wynne, the man behind Flying Fish, a nine-location seafood mini-chain in Texas. Though successfully running nine restaurants is noteworthy enough, Wynne's biggest claim to fame is something far more bizarre: He has what is likely (hopefully!) 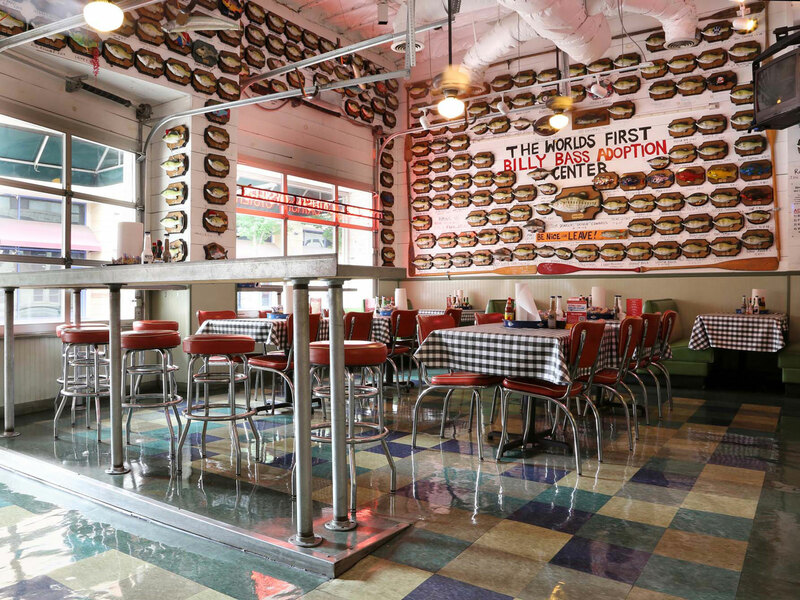 the world's largest collection of Big Mouth Billy Basses—that singing staple of gag gifts over a decade ago—and he displays them on his restaurant walls. "It's not normal, I'll have to admit," he told the news station. "'Take Me to the River' still haunts me in my dreams." Luckily for guests, the restaurant isn't constantly filled with the sounds of "Take Me to the River," the singing fish's signature song. The batteries have been removed. Instead, each fish is hung on "the world's first Bill Bass Adoption Wall" with the name of who donated it as well as the date of donation. When Wynne opened his first location in 2005, the "Adoption Center" only filled up one wall; now it's on every wall, as well as the ceiling. Wynne says the whole concept stems from a genuine concern for the poor animatronic fish that, by no fault of their own, often end up stuck in people's attics. "Why do we treat 'em that way? It shouldn't be that way," he told WFAA. "We wanted to make sure every Billy Bass has a home." He even puts his money where his mouth is… or his food where the donator's mouth is: Anyone who donates a Billy Bass gets a free basket of catfish. Talk about a win-win for everyone.